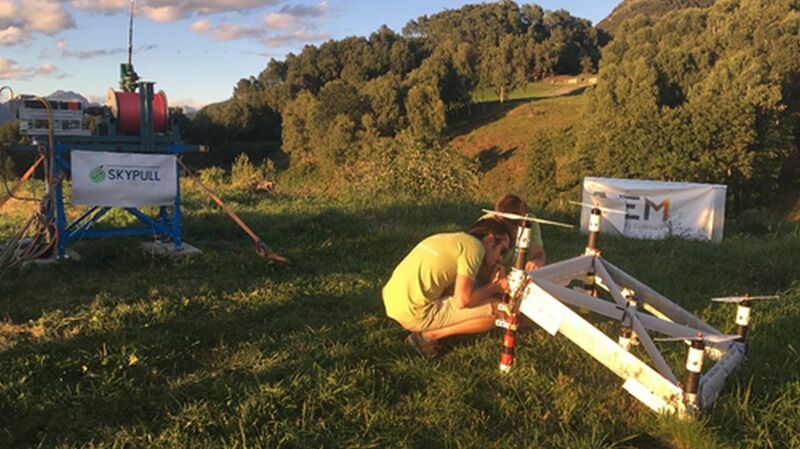 Skypull, a Ticino based startup that developed an Altitude Wind Energy (AWE) system made of an autonomous drone connected by a tether to a ground power generator, announced the successfully completion of the first full system test. The results are very encouraging and pave the way for the next development phases. Skypull was also selected for the ESA BIC finals and will receive seed funding of max. CHF 500’000. During the first week of august Skypull started the first field test of their solution with the intention to validate the concept and pave the way forward. With the support of the industrial partners, AEM SA and Studio Oikos s.r.l., Skypull completed the full test week at a small mountain in the southern part of Switzerland. Skypull is going to conduct another week of testing in October before launching formally the next development phase. This shall lead to the development of a commercially viable prototype with market-ready features and performances. In addition to the technical developments, Skypull is in the process of raising its first round of funding. For that purpose and in conjunction with IMD Business School in Lausanne, Skypull will be participating in the coming week in a specifically tailored Silicon Valley expedition with the aim to present the startup to potential investors, partners and other relevant stakeholders. The week after the test Skypull, successfully passed the Final Review of the ESA BIC Switzerland Incentive Phase and moves ahead to the Boost Phase. Besides getting access to ESA’s network of experts, Skypull wil receive funding of up to CHF 500’000. Skypull is an Altitude Wind Energy (AWE) system made of an autonomous drone connected by a tether to a ground power generator. Skypull climbs to captures the energy from the strong and abundant altitude winds between 200 and 600 meters above ground, and produces low cost electricity. The proprietary airframe and high-efficiency wing profile as well as the artificial intelligence that controls all the flight phases, provide Skypull with the required performance characteristics - especially in terms of system's efficiency, reliability and resilience - to produce electric energy from a renewable source with a cost competitive with fossil fuel based system, even in absence of public incentives or feed-in tariffs. Picture: Team member of Skypull in the test field.